We are a complete pool cleaning service - from green pool cleanup and weekly cleaning to stain removal, we can get and keep your pool water clean, clear, and blue. We provide a full range of services, tailored to each customer's needs. All of our services are on an as-needed basis; there are no long term contracts. Our technicians come every week, test chlorine, pH, and alkalinity, adjust the chemicals as necessary, and perform whatever physical maintenance is required. We vacuum and brush every pool, every week. Other services provided can include any or all of the following: inspection of equipment, cleaning the tile, skimming the surface of the pool, cleaning out pump and skimmer baskets, and/or cleaning the filter. Stabilizer and calcium are tested monthly. From a few weeks of neglect, to a few years... we've seen them all. We do a comprehensive check of the equipment, circulation, and water chemistry and design a custom treatment program for each pool. 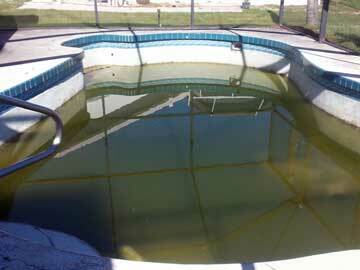 We address all of the problem areas to ensure that once the pool is cleaned up, it remains easy to maintain. 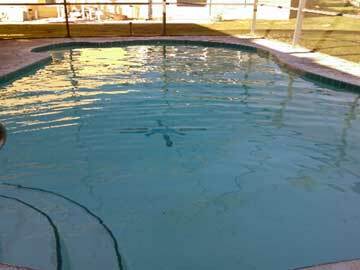 We perform an inspection on more than 35 different points of your pool. We will lubricate pump, filter and chlorinator o-rings as well as check your water chemistry, filtration, and circulation. We also inspect all of your pool equipment. At the end of the inspection, we provide you a summary of our findings and any recommendations we have to improve the appearance, performance, and care of your pool. We have seen a lot of different stains and have devised a treatment plan that works on most. When treating stains, we analyze your water, inspect the surface, and use a variety of chemicals to lift, remove and filter out the staining agents. We can then recommend the appropriate preventative measures to aid in keeping the staining from reoccurring. 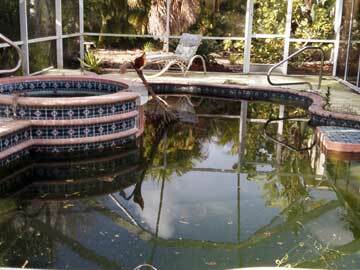 Phosphates can get added to your pool from a variety of sources. The most common are detergents and dust. When phosphate levels reach a certain threshold, it is very difficult to maintain adequate sanitizer levels and frequent algae outbreaks are common. 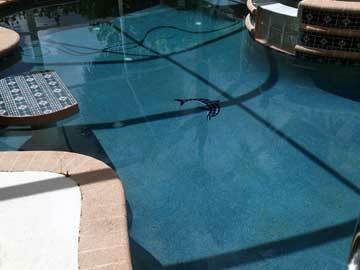 We can chemically remove phosphates from the water, making it easier to keep your pool water balanced and sanitized. Port Charlotte FL, Punta Gorda FL, Deep Creek FL, Punta Gorda Isles FL, North Port FL, Burnt Store FL, Harbor Heights FL, Rotonda FL, Gulf Cove FL, Charlotte Harbor FL, Lake Suzy FL, and Surrounding Communities.